Bangkok, Thailand – Every evening Bangkok’s Khaosan Road comes alive as bars open, blaring music to tourists and Thais on the hunt for cheap eats and drink. Mobile food carts clog the arteries of the famed backpacker strip. Bangkok has been crowned as the number one city in the world for street food. The Queen of Bangkok’s hawkers, Jay Fai, was awarded a Michelin star in 2017 and now serves up her dishes for Thai Airways flights. A citywide clearance campaign called “return the pavement to pedestrians” by the Bangkok Metropolitan Administration is an attempt to rid pavements of ubiquitous food carts and stalls. It has been successful in dismantling Bangkok’s most popular markets for street food, but has met resistance on Khaosan Road. “They want to make Bangkok look like Singapore. We want Khaosan to remain the same. This is why people visit,” Pornpetrumpa said. 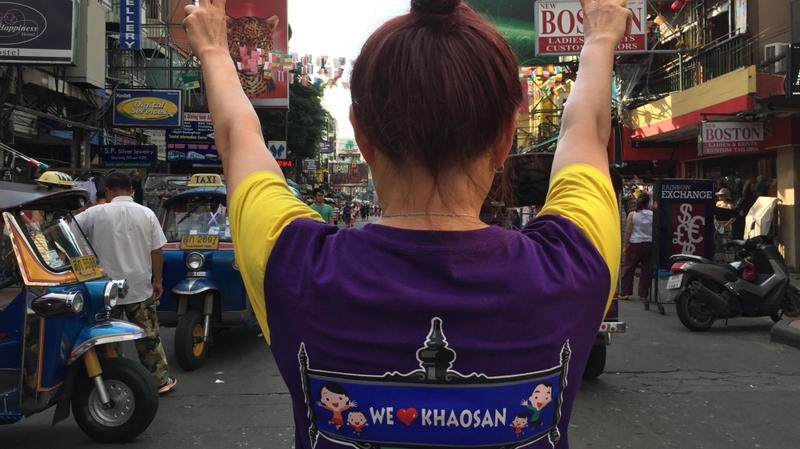 Khaosan Street Vendors Association is partnered with the Network of Thai Vendors for Sustainable Development – a group of 6,000 informal workers in 21 districts of the city. Both groups organised in 2017 to fight hawker evictions. They marched on Government House in Bangkok last month to protest Deputy Governor Sakoltee Phattiyakul’s order to restrict hawking on Khaosan Road pavements from 6pm to midnight only – effectively a daytime ban. Protesting has been against the law in Thailand since a 2014 military coup. But the Khaosan Street Vendor’s Association has staged regular events to raise awareness about the loss of livelihood for many Thai hawkers. Enforcement of this hawking ban – the second since August – has been sporadic, admits Yada Pornetrumpa. But she wants to see international pressure put on city officials to save the famed tourist haven. But continued tough talk from the city is making hawkers feel uncertain about their future on Khaosan Road. Many have decided to leave the area altogether, states Pornpetrumpa. We don’t want Khaosan to end up like other areas of Bangkok. We need to keep it like this. This month, Deputy Governor Sakoltee Phattiyakul pledged 88 million Thai baht ($2.7m) to redevelop Khaosan Road. The city now wants to get rid of pavements altogether, make the road level, and construct a roof over it. But the plan would have to be approved by the city’s conservation committee. 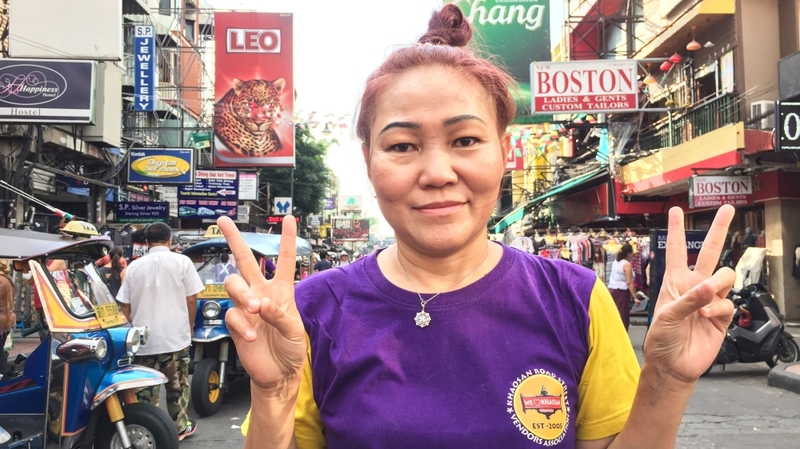 Yada Pornpetrumpa said Khaosan Street Vendors Association has never been consulted by the city on any of its various orders or pledges. The city once promised to exempt Khaosan Road, along with Yaowarat Road in Chinatown, as landmarks for tourism. Both are major tourist and cultural attractions in Bangkok’s historic area near the Chao Phraya River. Since 2014, 17,000 hawkers have lost their licences. Some have been offered to relocate to the city’s extremities, where they complain about a lack of customers and foot traffic. Five hundred of the 700-plus food vending areas have been removed or demolished by the authorities. Research by Thai academic Narumol Nirathron at Thammasat University states only 210 designated street vending areas will remain – about 10,000 hawkers in total. That’s a steep reduction from the estimated 240,000 now selling food and other goods on the streets of Bangkok. “If the police come, we [will] protect [the hawkers],” Yada Pornpetrumpa said. Last month, Bangkok’s JJ Green night market was shut down over a leasing dispute. In 2017, two popular night markets on Silom and Sukhumvit Roads were closed – forcing many hawkers to hide down Bangkok’s “sois” or alleyways. Maintaining order and hygiene is the city’s paramount concern. Many in the administration view street food as an eyesore in its effort to modernise the megacity. Khaosan Road is not a designated area for street food, states Narumol Nirathron. Her soon-to-be-published report “Street Vending in Bangkok” argues that hawking helps provide economic opportunity and reduce inequality in Thailand. But she mentions how unsanitary some food carts have become in Bangkok. According to Narumol Nirathron’s research, 88 percent of Thais buy street food every day. More than 92 percent of Thais interviewed believe cheap food is necessary for Bangkok residents. I believe it’s the more high-profile areas that are being targeted with this street food cleanup. The ones that have a lot of tourist traffic, high residential value, high property value or high property potential. Vallop Suwandee states that many of the city’s hawkers don’t fit this qualification and are, in fact, quite wealthy Thai farmers. Vallop Suwandee doesn’t know the exact number of hawkers who originate from Bangkok. But he proposes the city work with private developers to integrate them into new commercial developments. This has yet to happen, but many point to new shopping malls across Bangkok offering street food staples like somtam, or spicy green papaya salad, in designated food courts. This has proven popular with Thais, as office and construction workers now frequent these jaunts often. But, of course, the majority of people still buy food on the street because of its convenience. Some areas of the city where new residential development is booming have seen street food almost disappear, according to a Bangkok food blogger. “I believe it’s the more high-profile areas that are being targeted with this street food cleanup. The ones that have a lot of tourist traffic, high residential value, high property value or high property potential,” said Chawadee Nualkhair. Nualkhair believes that street food is too embedded into Thai culture and can never be rooted out entirely. There are several examples of hawkers like Jay Fai, the chef awarded a Michelin star, turning their street food stalls into culinary hot spots in Bangkok, so city officials may be fighting a losing battle against hawking.